The deadline to submit listings to be included in the 2019 Largest Law Firms magazine is the close of business Friday, March 29, 2019. Many thanks! Your firm has the opportunity to purchase an Enhanced Listing, which provides significant additional information about your firm. The price for this listing is $500. Once you complete this section, Virginia Lawyers Weekly will contact you to arrange payment. If you are submitting a free basic listing only, please select "I decline" in the prompt below, leave all other fields on this page blank and click "Next" at the bottom of the page to continue the survey. Before hitting the Submit button, please make sure your information is complete. You will NOT be able to go back and modify the online form once it has been submitted. 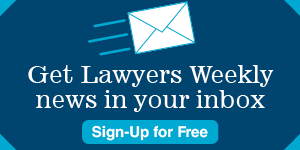 A copy of your Largest Law Firms listing will be emailed to the address provided on this page. If any information in your listing needs to be changed, contact Denise Woods at dwoods@valawyersmedia.com before the March 22 deadline.